storytime … and all that entails. Who do I think I am, anyway? 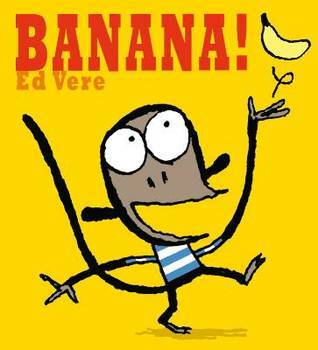 Monkey see, monkey…Do this storytime! Monkeys. Mischievous but sweet. Exotic yet familiar. Typically they have long tails and live in trees but I have been known to throw gorillas and other apes into the theme, too. 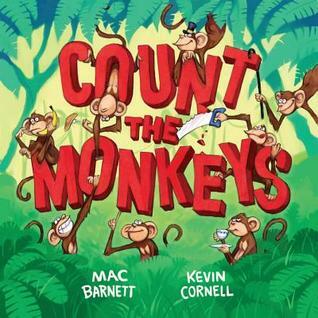 This counting book is really funny, of course, because Barnett and Cornell were in charge! There is lots of counting but none of it is actually monkeys. They have been scared off by … well, you’ll have to read it to appreciate it. It is supremely interactive from the first call of, “Hey kids! Time to count the monkeys!” to the various commands instructing the audience to raise their arms or hum a tune to the final end papers when guess who finally shows up? I read this to preschoolers who are active and in the zone. You need the energy of an engaged crowd to really make this sing. Be ready to laugh! I always yell out the title of this book because it has an exclamation point. I tell the kids that is the law and then I make them all yell it with me. This is the pictoral story of 2 monkeys. One of whom has a banana and one of whom wants that banana. You, as the reader, have to do a little work to get the story across in this one as there are only 2 words in the entire book: “banana” and “please.” But with facial expressions and drawing attention to various body language changes of the monkeys, you can translate the interaction. I read/experience this one with Preschoolers for the advanced concepts of personal interations. At the end, I tell the kids that they could read this one all by themselves since they already know both words. Then we practice reading the title again – exclamation point and all. This counting book has some of the most beautiful primate pictures ever. I especially like the 4 mandrills that reminds me of the Beatles For Sale album cover but they are all lovely and detailed and captivating. For the toddlers, we read through it, count the faces, and practice holding up our fingers. For the preschoolers, we spend a little more time noticing the eyes, the various haircuts (see if you can find the mohawk! ), and the resemblances to humans which works out well for everyone since the book wraps up with humans who resemble the monkeys and apes we have just counted! Oh, these little monkeys – what scamps they are! There are several in the series including Sitting in a Tree and Go Shopping that the kids enjoy but I generally go with the original Jumping on the Bed. If I have a smaller crowd, I use the book but if the room is full, I show the book and then we do the finger play all together. 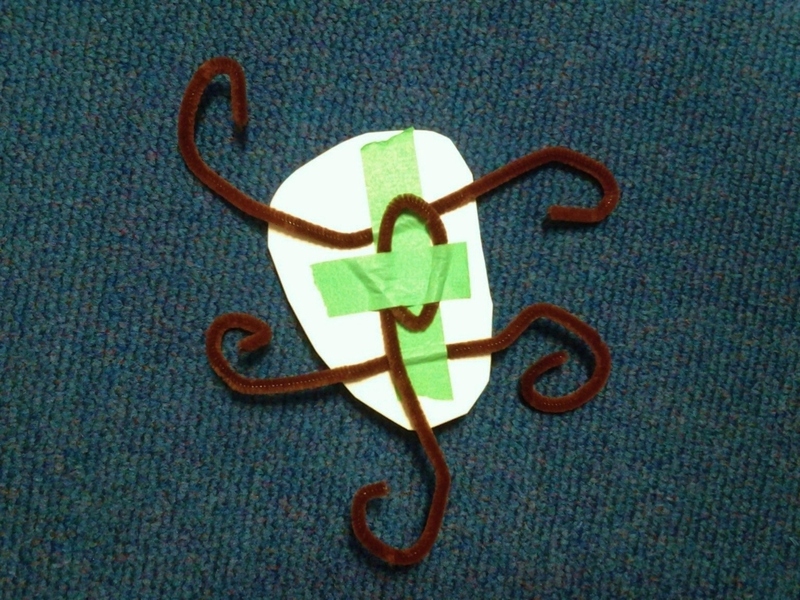 I’ve also told this story with 5 monkey finger puppets (ha! they match the books!) that go flying when they fall off. That gets the kids laughing pretty hard. I talked about this title a bit in my post Get Dressed! Clothes Storytime and I use the same style and delivery during Monkey storytime. Slobodkina wrote it in 1938 and has sold more than 2 million copies. I think the big book version really sells this story and I find all ages love it. I do tend to read it at the beginning of the program since it is long. I have a drummer in the house so this book is dear to me. Mike just can’t seem to stop tapping, clanking, and crashing through life. 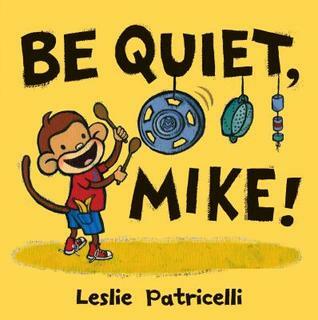 Of course, that also means he never stops hearing, “Be quiet, Mike!” from the folks around him. When he discovers an actual drum kit and then makes the dream come true for himself, his drumming is put to good use. The illustrations are bright and charming.and the refrain is catchy. Kids will love listening to this one – and will probably want to do a little drumming afterwards. Again with the Av2 Media Enhanced books. I just love reading these in storytime to both toddlers and preschoolers. The photos are terrific, the information is interesting, and parents love finding a series for their little ones and beginning readers. 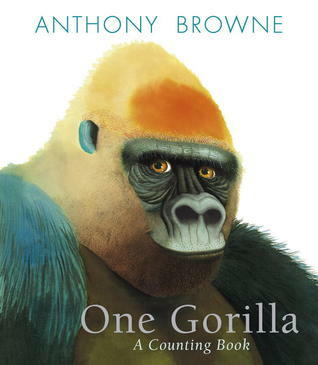 A great introduction to non-fiction for the storytime set. Bonus: I’ve learned a lot about the animals we discussed in storytime. 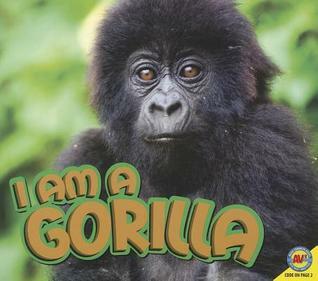 Did you know gorillas make 2 different nests each day? You do now. Oh, Nilson, you try so hard to keep it together – good job! 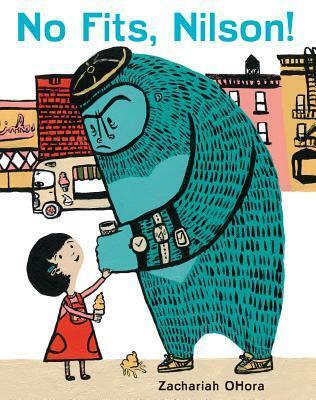 This is the story of a little girl, Amelia, and her giant teal companion, Nilson. As they go about their day with Mom, Amelia helps Nilson keep his cool by describing what they are doing, distracting him with her froggy coin purse, and promising him banana treats for later. But when Nilson gets the last banana ice cream – what does Amelia do? Nuclear meltdown. Nilson knows what to do, though, and helps his friend out. I read this to preschoolers because of length. The colors are great, the details of the pictures are fun, and the subject matter is very familiar to both our small ones and their grown-ups. 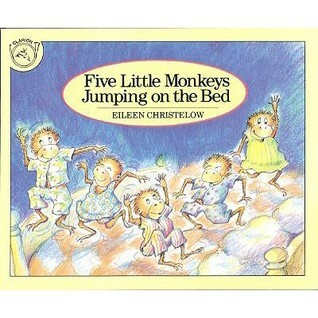 A nice variation on the classic “5 little monkeys” with lots more situations, pratfalls, and silly facial expressions. 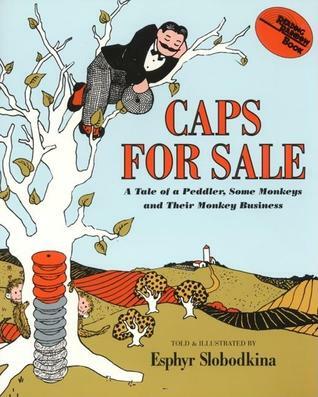 There is always one monkey who is contributing to the mayhem but whether she is obvious in a large groups or not, the cadence of the book and the bright illustrations make for a good read aloud to the preschool crowd. 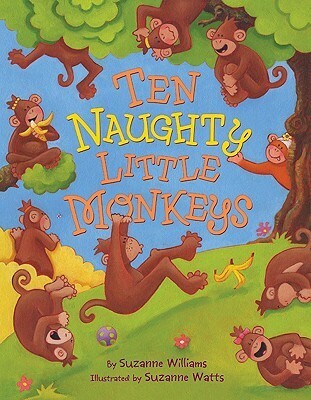 A simple story with rhymes, suspense, and cheeky monkeys. 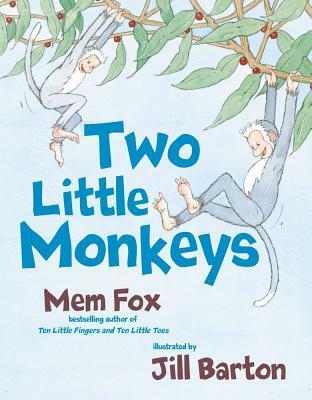 Mem Fox keeps it catchy with repetition and Jill Barton adds facial expressions to these sweet monkeys that resemble some of our audience members. The monkeys are playing on the ground but a leopard slowly approaches. As the audience encourages them to find safety, they climb a big, old tree. They huddle together and hide behind leaves. But wait, leopards can climb trees…..
Never fear, they escape to a smaller – less leopard-climbable tree – and enjoy a snack. In Toddler time, Mr. Alligator sometimes has allergies and sneezes those monkeys back out at the end and we collectively hope that the monkeys will be smarter next time. 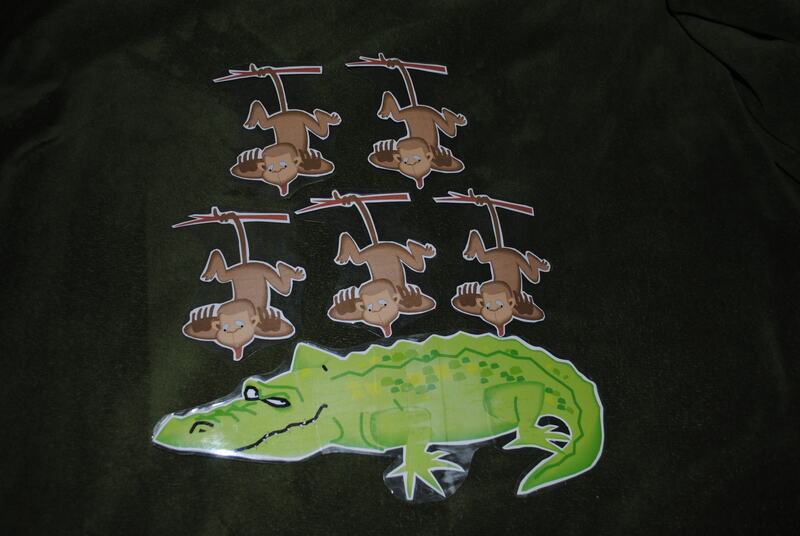 In Preschool time, it’s more of a morality tale and we end up with one fat alligator and no monkeys left in the tree. 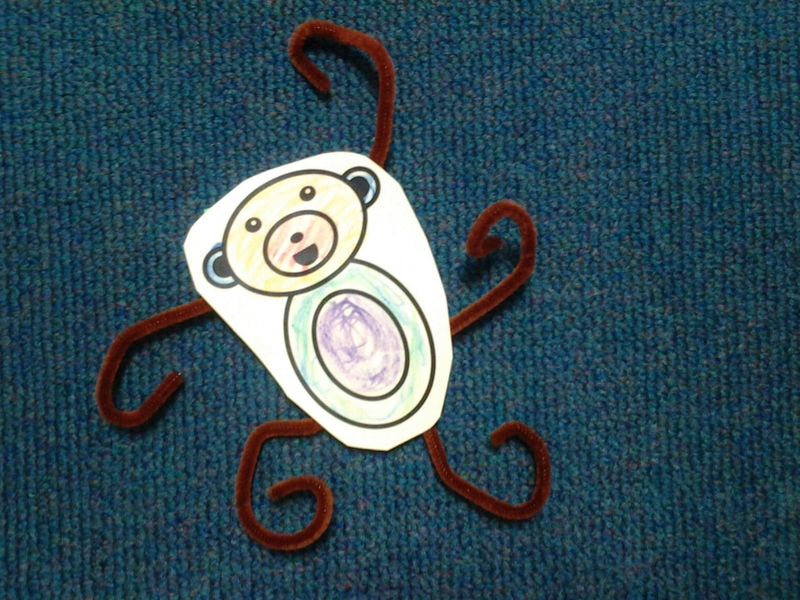 Each child gets a monkey body that I’ve copied on to cardstock – just for the sturdiness. They work their fine motor skills by coloring the body in any fashion they like and then tape chenille sticks on to the back of the body. We usually go with 2.5 or 3 sticks but of course your monkey can have as many arms, legs, and/or tails as you want. They may need help getting the proper amount of tape – it can get away from them pretty easily. Then just curl the ends of the sticks and voila! a monkey to hang from your shirt, bag, ear, mom, etc. Monkey around with these ideas and host your own barrel of fun!